Okay, let me admit this upfront. 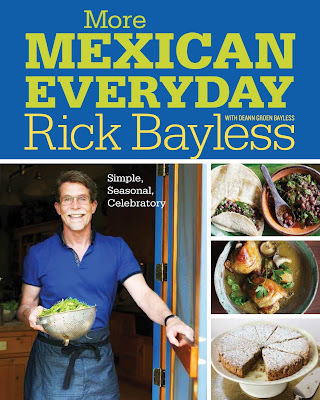 I'm a huuuuge fan of Rick Bayless, and I think I might have all of his cookbooks. On his television shows he seems genuinely enthused about not just the food of Mexico, but the culture, as well. I think that makes him much more interesting that someone who simply knows the ingredients. When it comes to his cookbooks, they are recipes you can actually make at home. While I love the idea of completely authentic cooking (whatever that is), when it comes to making a recipe I don't want to find out that I need a berry that must be used fresh and is only available during the full moon in July on a remote mountain peak. And, his recipes are things I want to eat. The flavors make sense. The ingredients belong together. Like for example, in More Mexican Everyday , his Spaghetti Squash Fideos with Chipotle, Chorizo, Crema and Avocado. He uses spaghetti squash in place of noodles (fideos are a type of noodle) and serves them with some typical Mexican ingredients. There's nothing in here that makes me wonder if the flavors will work. And once in a while, he has a little bit of kitchen genius, like his recipe for cajeta (basically a caramel sauce) that is cooked in a slow cooker. I've made a similar cajeta on the stovetop and I have to say that watching it and stirring it was ... a long and boring process. Cooking it in a slow cooker makes a lot more sense. At the end of the cooking time, you do need to keep an eye on it, but for most of the 24 hours (yes, that long!) you just let it cruise along. I learned something useful from this book, too. You know how corn tortillas are never so great unless they're fresh? Well, his method of reheating is completely different from everything I've done. He suggests sprinkling the tortillas with about 3 tablespoons of water, wrapping them in paper towels or in a clean kitchen towels, placing that in a microwave-safe plastic bag and folding the top over (but not sealing it), microwaving at 50 percent power for 4 minutes. Then you let them rest 2 or 3 minutes before serving. I never thought about cooking them for that long! He also has instructions for steaming on the stove, if that's your preference. Overall, I love this book. Yup, that's what I said.